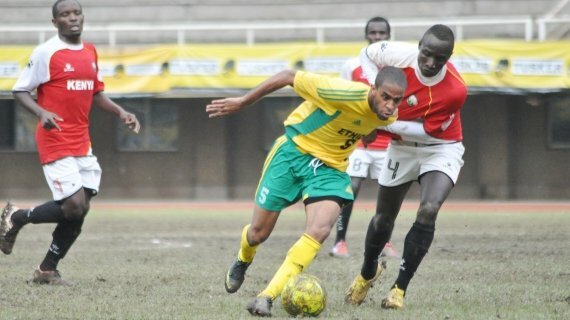 KENYA and Ethiopia drew 0-0 in their Group ‘A’ match at the Cecafa Challenge Cup in Nairobi on Wednesday. The tournament opener was a 2-1 victory for Zanzibar against South Sudan, the country taking part for only the second time. Harambee Stars started on a bright note, surprisingly playing possession and slick passing football, traditionally the forte of the Ethiopians who this year just missed qualifying for the 2014 Fifa World Cup at the last hurdle; they were denied by Nigeria. Very early, South Africa-based David Gateri [an-ex Nairobi City Stars of the Kenyan Premier League player] controlled a good ball on the left flank and delivered a pinpoint cross to striker Allan Wanga in the box. But Wanga did not direct the ball downward and instead went over the bar by just inches. Earlier, however, Gateri should have slotted in a beautiful cross from the right by Edwin Lavatsa but it appeared the Kenyan forward’s shirt was pulled and he went down to the ground. He politely notified the referee that indeed someone had tagged his shirt. Harambee Stars captain of the day, the Thika United midfield talent Francis Kahata then ran through the right flank but his cross was too weak in the 20th minute and the ball again went inches wide. Ethiopia had their chances on goal as their fast paced players forced Harambee Stars players to commit fouls with David Owino and Aboud Omar getting cautions from rough tackles in the first half. Musa Mohammed had a chance to set up Allan Wanga towards the dying minutes of the first half but the ball was snatched from his feet by Ethiopia’s skipper with Wanga waiting in the box. Kenya had a scare when preparing to take a long ball, their ‘keeper David Ochieng’ lost his footing and only a scramble saved the day when he turned the ball for a corner past the far right. The second half was a nail biting encounter as both sides went for the offensive early. Both keepers being kept busy between the posts for the entire period. Ethiopia had the chance to take the lead through a curled in free kick by Yousuf Yassin but ‘keeper Ochieng’ was at hand to save the situation. Kenya then attacked with Lavatsa earning them a free kick at the edge of the area after being fouled by James Thok but the free kick by Kahata could not be put back to play by Atudo who placed it over the net. Gateri then missed what many viewed as golden chance after being released by Omar and Lavatsa in a great shooting position tripped. Lavatsa and Kahata then engaged in a lovely 1-2 in attack but the latter’s pass was too powerful for Lavatsa who was already waiting in the box. Experienced striker Yonatan Kebede did not have time to get a shot on target after coming on after being tightly marked. Kenya head coach, Adel Amrouche was nowhere to be seen as Kenya played. The night before had had bitterly complained that the Kenya management had ignored the team and had no basics such as training gear and drinking water. Assistant coach James Nandwa took charge of the Kenya team and reported that Amrouche, a Belgian was “ill”. This result leaves Zanzibar atop of Group ‘A’ after winning in the tournament opener against South Sudan. 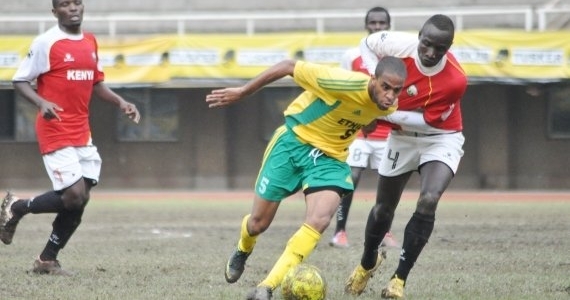 Zanzibar kicked off the 2013 Cecafa Challenge Cup on a high, seeing off South Sudan 2-1 in the 2pm kick-off at the Nyayo National Stadium. The match started on a slow pace with the Sudan keeper Juma Jinaro gifting the opponents the first goal in the fifth minute after missing the ball from a cross allowing Suleiman Kassim Suleiman to slot in. That was the only goal of the first half despite the ‘keeper again misjudging another cross towards the end of the 45 minutes but recovering in time to save the situation. The second half marked improved performance as both sides attacked with more power and energy and the keepers being more alert this time. Zanzibar, however, stretched the lead after 10 minutes from a Saleh Ahmed cross. South Sudan got their consolation goal five minutes later after a fruitful counter attack from the left wing with Fabiano Lako finishing off with a fine low shot that beat Abdalla Rashid on goal.